Ford Field underwent a pink-out as the Detroit Lions beat the Chicago Bears 24-13 in a nationally televised Monday Night Football game. Many spectators in the crowd of 67,861 — a Lions Ford Field record — waved bright pink “Curable” towels that Blue Cross distributed in honor of Breast Cancer Awareness Month. The Blues also presented a $10,000 donation to the American Cancer Society before the game. Below is a roundup of news coverage about the promotional event and a slideshow of photos from Ford Field. And don’t forget to share your story of surviving breast cancer at Making Strides on A Healthier Michigan. Detroit News: The Curable Towel, modeled after the Pittsburgh Steelers’ Terrible Towel, will be distributed free to the first 50,000 fans at Ford Field, who will be encouraged to wave them on national television to advocate for breast cancer awareness, the National Football League’s pet cause in October. It also is the first marketing hit for a new Metro Detroit fundraising effort. The towel makes Detroit stand out, said Stephen McDaniel, an associate professor at University of Maryland and a consumer psychologist who studies sports marketing and fan behavior. Freep: As part of Breast Cancer Awareness Month, Blue Cross Blue Shield of Michigan will supply 50,000 bright pink towels to fans inside the downtown Detroit stadium for tonight’s game. The towels are meant to raise awareness about the importance of breast cancer screenings. Fans are urged to wave the towels during the nationally televised game. Crain’s Detroit Business: Blue Cross Blue Shield of Michigan is supplying 50,000 bright pink towels as part of a partnership between the Lions and the health insurer. Both organizations will honor breast cancer survivors. The Blues also will make a $10,000 donation to the American Cancer Society. I am proud to work for such a wonderful company! 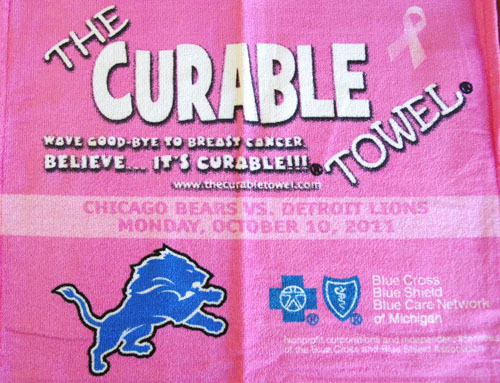 It would be so nice if every BCBSM employee could recieve a “Curable Towel” for breast cancer awareness.